Update 11/15/15: Harold's is closed. In a word: Race to the top chicken joint in town. JM and Nichole ate the 2-pc chicken dinner, a piece of catfish, a pizza puff, fries, fried okra, and a watermelon frozen lemonade. The bill was $17, or $8.50/person, plus tip. 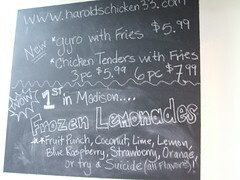 JM gave a Harold's Chicken Shack an A-; Nichole gave Harold's Chicken Shack an A (see our grading rubric). Harold's earned a spot on our lifetime top chicken list from the first bite. The meat is the best since Chicken Unlimited, moist and flavorful, and the breading was peppered and light. The frozen lemonade was excellent and refreshing. It's like a Slushee without the industrial aftertaste. It comes in about eight flavors, which makes for 255 permutations (excluding the "just crushed ice" flavor"). 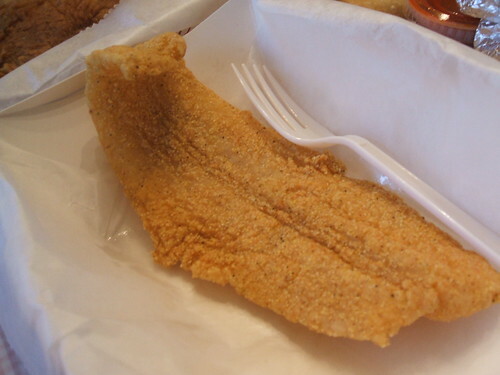 The velvety catfish was enclosed in a cornmeal shell. It was perfect. The pizza puff was phyllo flipped around a cheesy marinara mix and middling-grade sausage. It was like a Hot Pocket with a super filling. We got carryout because we were pressed for time, but Harold's is well suited to eating in and hanging out. It's not really fast food by a long stretch. And the people behind the counter and in the dining area are friendly and talkative. If you have a high school ID, you can get a $4 lunch of wings and fries. I LOVE this place - so glad you enjoyed it!! You must be joking. This place is absolutely terrible, top to bottom. 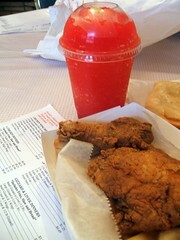 We went back for chicken and frozen lemonade. The house BBQ sauce is tasty (tangy-sweet). Plus, folks there say "hi" and stuff. It's kinda nice.